Eric Chazankin LET IT SNOW'Almost, Maine' captures the fables and foibles of love. 'Almost, Maine' runs Thursday–Sunday through Dec. 18 in the Studio at Sixth Street Playhouse. 52 W. Sixth St., Santa Rosa. 8pm, Thursday–Saturday; 2pm, Sunday. One Saturday matinee, Dec. 17, at 2pm. $10–$25. 707.523.4185. 'Light Sensitive' runs Thursday–Saturday through Dec. 10 at Main Stage West. 104 N. Main St., Sebastopol. 8pm. $15–$20. 707.823.0177. Two offbeat shows about love in wintertime have opened in Sonoma County, each bringing its own kind of warmth and magic, though is neither without minor inconsistencies. 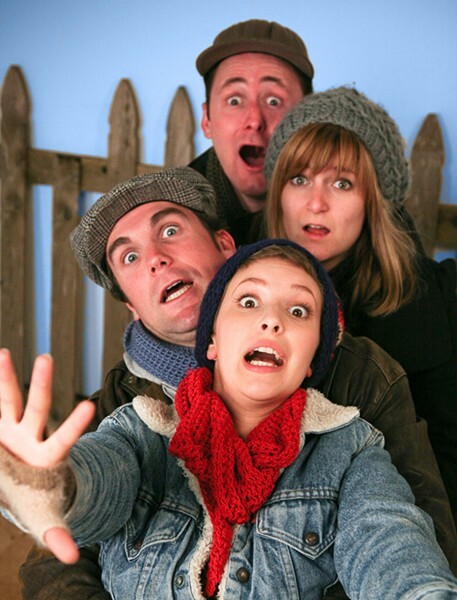 John Cariani's Almost, Maine, at the Sixth Street Playhouse Studio Theater, is a series of vignettes about love, all set on the same night (and all at approximately 9pm) in a tiny New England town where the northern lights are playing tricks on several pairs of friends and lovers. Cariani's is a world where magical realism blends with situation comedy and a touch of Aesop, nicely brought to life by director John Shillington, with spot-on set design by Jay Lasnik. A cast of four (Clint Campbell, Nikki Lyon, Autumn Mirassou and Peter Warden) play 19 characters: a young woman challenged by her intended to reconsider how close they really are; a repairman who falls for a woman with a broken heart; an unhappily coupled woman who teaches her oddball neighbor to feel a new kind of pain—and several more. In the town of Almost, when friends fall in love, they literally fall. When heartbreak occurs, the pieces can be carried in a paper bag. And when the other shoe drops, watch out. Some of the vignettes are lovely and funny, though some miss due to a discordant tone in which yelling and shoving force away the magical-wonderland vibe. Still, there is much to savor in this "almost" perfect but perfectly lovely midwinter treasure. In Jim Geoghan's Light Sensitive, with just one weekend to go at Sebastopol's Main Stage West, Tom, a bitter, blind ex–cab driver (John Craven) must face off against the determined and slightly peculiar volunteer Edna (Laura Jorgensen) when she arrives on Christmas Eve to read to him. Smartly and crisply directed by Everett Chambers, with a little gem of a comic performance by Keith Baker as the crusty cabbie's longtime friend and enabler, Lou, Light Sensitive is fierce and funny, though the story wraps up a little too sitcom-neatly in the final moments. Nevertheless, with dialogue so juicy you'll want to quote it for days, Light Sensitive is as nice as a surprise as Edna turns out to be for Tom.